hopeless foodie: Quick Bites: What The Pho? Quick Bites: What The Pho? For the life of me, I don't know why it took me so long to check out What The Pho? in Duluth. I have driven past this restaurant on Pleasant Hill too many times to count, but it wasn't until recently that I stopped by for a first visit. 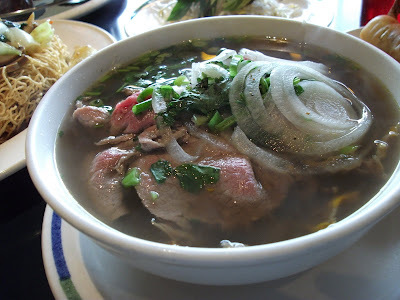 I wouldn't normally order a steaming bowl of Vietnamese beef noodle soup during the dog days of summer, but on this visit I decided to order a small bowl to sample. If this is considered "small", the "large" bowl must be humongous! Needless to say I wasn't able to finish the entire bowl, but I certainly enjoyed what I had. The broth was rich, tasty and satisfying. Now that I know what to expect in terms of portion size, I can see myself ordering just a small bowl of pho and making a meal out of it on a future winter evening. 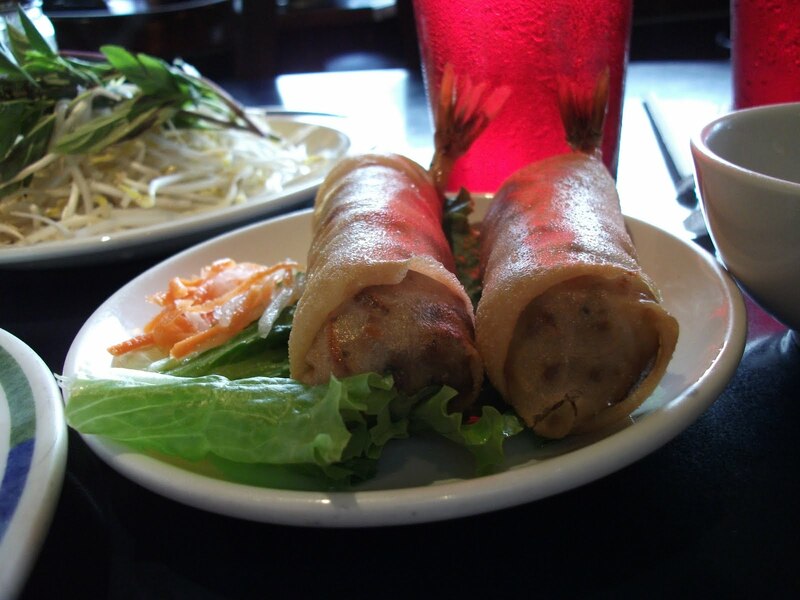 I loved my Cha Gio (egg rolls): perfectly crispy, not greasy and very delicious. They were so good that I almost bought an extra order "for the road", but I didn't want to be greedy. 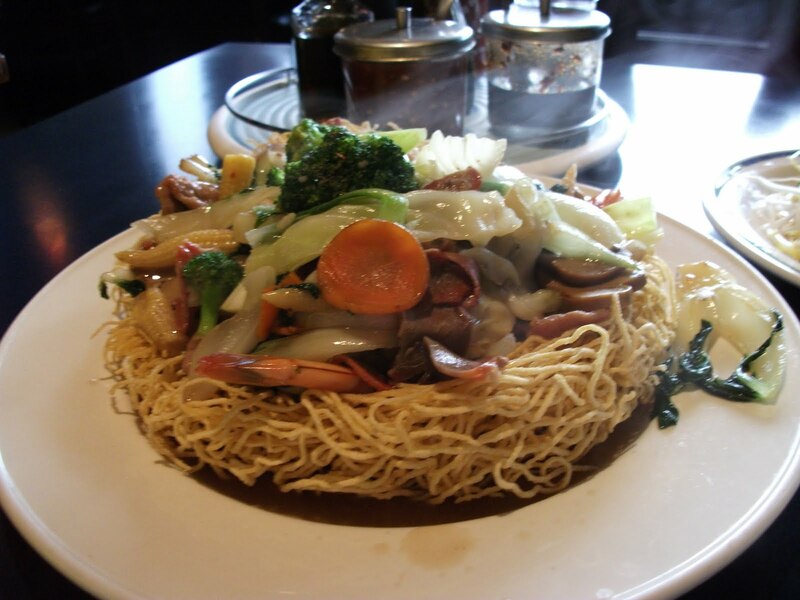 Heeding Chloe's (Chow Down Atlanta) recommendation, I ordered the crispy noodles and was not disappointed. This was so good: delicious stir-fried meats and veggies on a bed of fried egg noodles. I'm looking forward to making a return visit to What The Pho? to sample some of the other dishes on their menu. Great food, prompt service, and very affordable-no complaints here! Hey Tina-- try the rice dishes next time. They have one with Vietnamese-style galbi (Korean short ribs) and it's good. Their noodle bowl with grilled shrimp (Bun Tom Heo Nuong) is also fantastic. Will do, Chloe. I love Bun, so I'm definitely planning on trying theirs on a future visit. Thanks for the suggestions!